Ok, I have to admit, I am so done with completely and absolutely over winter! But, I do have to admit that when the snow is falling and really white, it can be beautiful. We got another 4-6 inches this morning, but were still at school. This picture was taken just as the snow was finishing falling. This is a courtyard at my school. It is beautiful in the spring and fall when everything is in bloom. But, I thought it was beautiful today with all of the snow too. 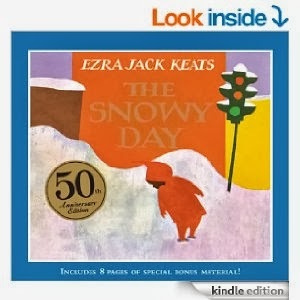 One of my favorite children's books is The Snowy Day by Ezra Jack Keats. It is one book that I really remember from my childhood. I have always loved the colors and pictures in this book. During the last two weeks, we have shared this book with our social-language group. If you haven't heard about our social-language group before, it is a group of students with ASD (Autism Spectrum Disorder) that I co-teach with the school social worker at my school. We work on both functional communication skills and social language skills. The great thing about our groups is that for some of them we have general education peers join us. They work with us as a part of SNAPs (Students Need A Pal). This program is set up to have general education 3rd, 4th, and 5th graders help out in the ASD rooms. They serve as models during recess and structured groups. It is a great program, and we have a lot of fun with these students. Back to The Snowy Day. Because of all of the snow, we thought it would be great to share this book. First we read the story to all of the students. For those that could answer verbally or with communication devices, we asked comprehension questions throughout the book. You can get a copy of this free visual HERE. We had the SNAPs peers ask questions to start, and then the students with ASD answered and asked the same question back. We had fun learning about what each person's favorite activity in the snow was. The last activity that we did was making snow paint. All you have to do is combine equal parts glue and shaving cream. When it dries, it looks like fluffy snow! We mixed up a bunch of snow paint and had the students paint onto a large sheet of blue paper. This was a great sensory activity! We also dragged the feet of an action figure through the "snow" to make tracks- just like in the book. We let the pictures dry, and then the following week we put pictures of the students onto the snow. We cut out a little orange snowsuit shape, and then put a tiny picture of each student where the face would be. I think they turned out really cute! This unit was a lot of fun to complete with our students. They loved the sensory activity of the snow paint, and I loved sharing this wonderful book with everyone. While I had this book out, I also used it with my Kindergarten Phonological Awareness intervention group. I used all of the activities from my phonological book companion for The Snowy Day. This companion is available at my TpT store HERE. Happy snowy days everyone! Hopefully it melts here before summer!